You may know how important XML Sitemaps are, but did you know that HTML Sitemaps are also pretty important for your SEO as well? They help not only users, but search engines more easily find your content. The thing is, not all blogs seems to use HTML sitemaps. This is a missed opportunity in my opinion. In this tutorial, I’m going to show how to very quickly and easily create an HTML Sitemap. It’s so easy with WordPress that you shouldn’t have any excuse not to create an HTML sitemap after reading this tutorial (or watchingIn the quick video). Make sure you have an XML sitemap: You want first to make sure you have the basics covered. You want to have a plugin create your sitemap for you, or you can create an XML sitemap through many free online tools. Submit your XML sitemap: You also want to manually submit your sitemap into Google Search Console. Even though Google will likely find it without manually submitting, it is always good practice to submit one manually. Install Yoast or All in One SEO: There is some debate between using Yoast SEO vs All in One SEO . I use Yoast SEO. They are both great plugins, but Yoast is a slightly better SEO plugin. If you have a plugin like Yoast SEO or all-in-one SEO pack, you can configure it to create an XML Sitemap for the search engines. With Yoast, it will automatically create the XML Sitemap for you by default. If you could only choose one type of Sitemap, I would choose to implement an XML Sitemap. However, it is also good to create an HTML Sitemap for both users and search engines. XML Sitemaps are mainly for the search engines so they can find all your pages and crawl your WordPress site. Needless to say XML Sitemaps are critical for the search engines and your SEO strategy. That doesn’t mean you should only use an XML Sitemap, though! For SEO purposes you definitely want to have an XML Sitemap. XML Sitemaps are a standard in setting up your basic SEO configuration. HTML Sitemaps, on the other hand; I would consider optional. I do recommend that everybody creates an HTML Sitemap along with their XML sitemap, but it is optional. It’s nice to have an HTML Sitemap because they are great for user experience. Users often look for an HTML Sitemap so they can browse through your website topics and pages very quickly. Adding an HTML Sitemap to your WordPress blog can have a lot of benefits as well as having your XML Sitemap. It’s good practice to create both an XML Sitemap and an HTML Sitemap for both users and search engines. Where do you put your HTML Sitemap? You can place the HTML Sitemap anywhere you see fit, and anywhere you think would be beneficial to users. Usually, most blogs have their HTML Sitemap somewhere in the footer so both users and search engines can easily find it. Many SEO plugins will automatically create your XML Sitemap for you. The problem is, with many of these popular SEO plugins, there is no way to dynamically add an HTML sitemap. Some themes may have the functionality to do so, but many don’t. Find a plugin that will dynamically create it for us. 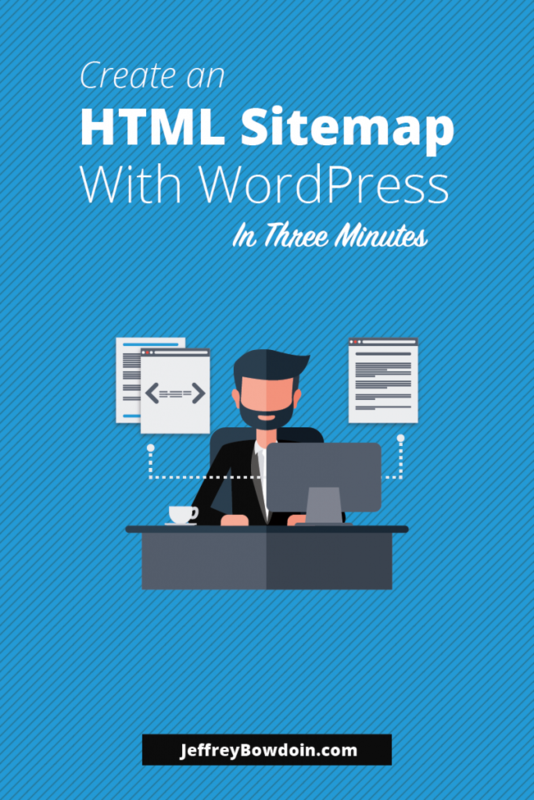 If you wanted to, you could create an HTML Sitemap by manually creating it in WordPress. This would obviously take a long time to compile all your posts and pages on one page. install: install the plugin like you normally would any other plugin. create a new page: Create a new page named Sitemap, then publish. configure: go to settings > SEO HTML Sitemap > Sitemap page and add your Sitemap page. location on the page: this is just if you want to customize where the HTML Sitemap links will be. I usually just choose after pages content. Number of Columns: this is just the amount of columns that you wanted to display. I usually just choose one column layout. Link to XML Sitemap:: If you already have an XML Sitemap created by your plugin (like Yoast), then you can choose to link to your XML Sitemap. That’s it, guys. There’s not much to it. It’s such an easy thing to do that you should do it on every blog you create.